You have access to the whole house with kitchen, bedroom, bathroom and living room. You do not have to share this apartment with others. The Jordaan is a famous district in the center of Amsterdam. 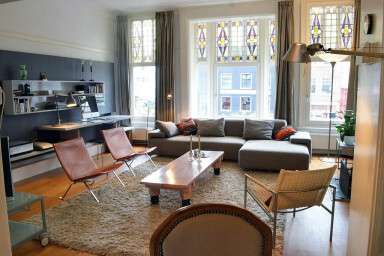 Originally it was a working-class neighborhood, but now the Jordaan is one of the most expensive locations in Amsterdam. Most of the streets and canals are named after flowers and trees. It is a cosy neighborhood with many traditional cafes, art galleries, modern art and specialty shops and restaurants. Many houses have inner courtyards, the courtyards were built by rich people for elderly women. There are 3 markets in this district; the Noordermarkt, there is a market at the Westerstraat and at the Lindengracht. Around these areas there are a lot of traditional cafes and bars. The world famous Anne Frank Huis is located in this district. It is a biographical museum dedicated to Anne Frank, who was a diarist during the Second World War. From Schiphol take bus 397 to "Appeltjesmarkt/Marnixstraat". From Amsterdam Central Station take tram 13 or 17 to "Appeltjesmarkt/Marnixstraat"
Check in after 21:00 is possible but it costs an additional of 20,- euro. After 0:00, we ask an additional 50 euro. For other in- and check-out times please contact me. Are you interested in a late check out? Please check the availability 2 days before your check out date. If the apartment is available we offer a late check-out at 14:00 for an additional charge of 20 euro.